Atletico de Kolkata host FC Goa in the first leg of the semi-finals at Saltlake Stadium in Kolkata. Atletico de Kolkata finished 3rd in the Indian Super league table, while FC Goa booked a berth in the semi-finals after finishing second. Both sides met in the penultimate game of the first round which ended in a 1-1 draw. Atletico de Kolkata have a host of injury concerns, while FC Goa rested a number of key players in their last game and hold an advantage over the home side. Kolkata’s Salt Lake Stadium will be hosting the 7th and final round robin game for Atletico de Kolkata, the average attendance for the games have been close to the 35,000 mark and a huge home crowd will be looking to push Kolkata into the next round. Antonio Habas has a major headache ahead of the first leg as a number of key players are out injured. Fikru was absent from training and is expected to miss the game, Baljit Sahni is suspended for picking up four yellow cards, Arnab Mondal is out injured for a week, Josemi is carrying a knock and Biswajit Saha is also expected to miss the game due to injury. Jakub Podany is expected to start up front, after impressing in the last game. Ofentse Nato might partner former Liverpool man Josemi at the back. 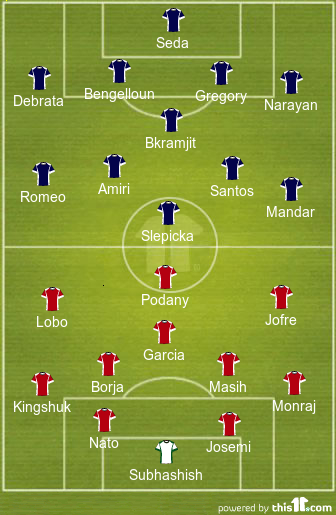 Rakesh Masih and Borja Fernandez might start in the middle of the park. Cavin Lobo who scored twice against FC Goa in Goa is also expected to start. Bruno Pinheiro was sent off in the last game against Atletico de Kolkata and is suspended for the first leg of the semi-final. Arnolin and Bengelloun should start at the back for FC Goa. Jan Seda is also expected to return between the sticks, along with Mandar Rao Desai and Romeo Fernandes in the midfield. FC Goa’s highest goal scorer Slepicka will also return to the starting XI after being rested in the last game. The French defender Bengelloun will have his hands and feet full with the guile and craftiness of Luis Garcia. Everything positive from Atletico de Kolkata has come from Luis Garcia who is the most important clog for the Kolkata club, Garcia has scored twice and assisted twice. If Bengelloun can stop Garcia from being an influence in the game, Goa will be favourites to get something from the game. Slepicka is one of the reasons why Goa has gone the entire 2nd half of the league season unbeaten, the Czech striker has scored 5 times and has 4 assists to his name. Josemi, who has played more in the centre of defence rather than as a right back would not only have to keep an eye on the Czech but will have to marshal his defenders well so as not to concede an important away goal against the in-form side of the league. 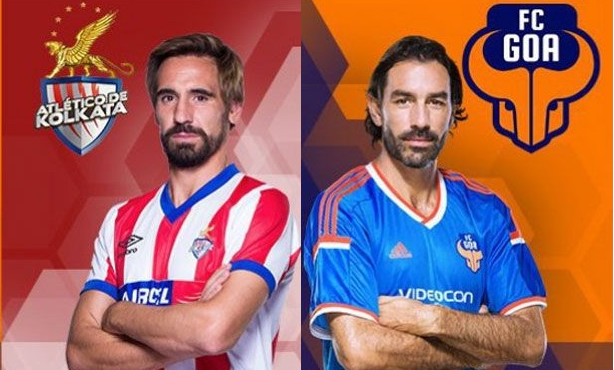 With a number of key players injured for Atletico de Kolkata, we expect FC Goa to take advantage of the situation.